Microsoft's Windows 10 mobile development branch has removed the FM Radio functionality. The reason for such change is yet to come across in the media. In between the users are encouraged to use the third party apps. There are plenty of good apps out there that can extend the default app functionality and even offer more features. Android and iOS don't have the default radio functionality built into OS either. However third party manufacturers design the Radio apps before releasing the phone. 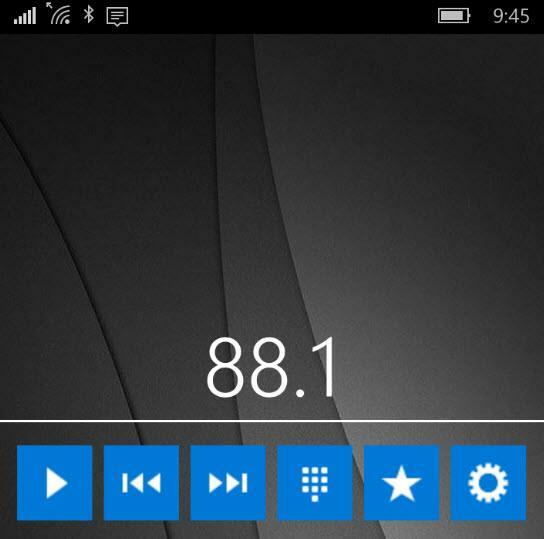 So Windows 10 phones are not going to have much issue with the lack of FM Radio app. Let's take a look at the FM Radio apps for Windows 10 mobile. This app may look minimal but offers a wide range of features. 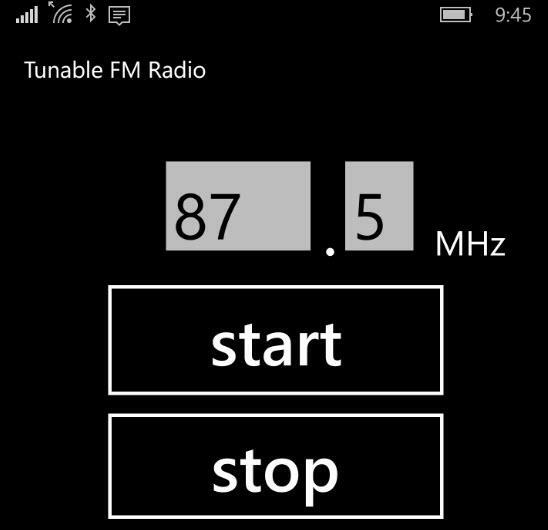 In fact this is the recommended app if you want the FM Radio functionality back into your phone. It has option to bookmark the channel. This makes it easy for you to access selective channels. Also there is a favorite icon that helps make the channel play by default when you start the app. One interesting feature that I have found here is the ability to backup the program on OneDrive. So even with version change or so you can run it and use it for compatible phones. You can also tune the frequency manually or automatically using the search button. The functionality of the app is very simple. It requires you to select the channel from the available set of bands. It can search the location for you or you can manually find it. The location box shows the country or the place which is being checked for available FM channels. Apart from that you get option of pause, stop and play buttons. So there is a lot of minimal display at use here. There seems to be lack of features like bookmarking and favorites. So you have to search for the channel every-time you wish to use the FM Radio. And this makes it very hard to use the app. Still the app is free on the Windows store and you can use it if you decide not to use the paid apps. It's not just minimal interface but looks more groovy. And the way you choose the frequency using the circular slider makes it very smooth to use. Also it has features of almost every FM Radio app. So on the feature side you're pretty much covered. The app is known to work with other version of Windows phone namely 7 and 8.1. You can set custom background images for the radio. If you choose to have custom background then you can also make the radio controls hide after specific time to keep the custom background as wallpaper of current running app. You can make some specific frequency as favorite radio channel. You can also find the stations manually or dynamically using the search feature. If you want feature and the looks then go ahead with this app. App is free to download and use. When you just don't want to limit yourself to FM Radio, then app like TuneIn radio can be really good. In this app you get the option to tun in to the local radio from AM and FM radio channels. And you can also choose paid and free radio channels hosted online. Either way you can get the controls inside the app. And you can tune for the frequency right from the slider controls. The app however requires internet connection for the AM radio channels. You have plenty of choices when it comes to choosing the music genre and also the type of content you wish to access. Also the internet radio channels will require a lot of bandwidth too. So make sure you are using the network that doesn't have bandwidth cap. The app is free of cost but it does require subscription for the paid radio channel access. Considering the Mobile development SDK has the ability to scan through FM frequencies, you'll continue to have the FM radio apps on Windows mobile. Though Windows has removed the default FM radio app, this doesn't stops developers to offer alternatives. So there is always going to be an option for those who want to use FM Radio. If you find it harder to stay without FM channel access then one of the app from the above list can be useful for you.